(From Tamron lens literature) Tamron introduces next-generation high-speed 24-70mm F/2.8 zoom lens with advanced features. Versatile new lens delivers ultra-high image quality, image stabilization of 5 stops1 and superb performance even in backlit scenes. Tamron Co., Ltd., a leading manufacturer of optics for diverse applications, announces the launch of a new high-speed zoom lens, SP 24-70mm F/2.8 Di VC USD G2 (Model A032), for full-frame DSLR cameras. Model A032 is a fast f/2.8 zoom that achieves top-level image quality. The new Dual MPU (Micro Processing Units) provides rapid autofocusing with improved accuracy and the highest vibration compensation performance of any lens in its class2 (CIPA level of 5 stops). The use of specialized, high quality glass materials (offering greater optical transmittance) for the lens elements assures superior color reproduction and greater sharpness, while the application of Tamron's exclusive nanotechnology-based eBAND Coating substantially curbs the ghosting and flare that are prone to occur in backlit photography, successfully improving the overall optical performance of the lens. Additionally, model A032 provides the added conveniences of protective Fluorine Coating, Moisture-Resistant Construction and a locking lens hood. Photographers can use this new high-speed zoom lens for wide-ranging purposes, including landscape, portrait, news, travel and many others. The Tamron SP 24-70mm G2 in Nikon mount will be available in August and the Canon mount in September at $1199. 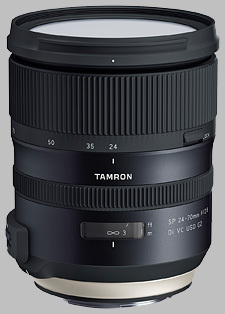 The new A032 is equipped with Tamron's proprietary VC (Vibration Compensation) system. Adding an MPU dedicated to VC processing unleashes a new-generation algorithm, ensuring the highest vibration compensation ability in the class (CIPA level of 5 stops). Even in low light or with slow shutter speeds, photographers can enjoy shake-free handheld shooting with ease and comfort. 1. CIPA Standard Compliant. For Canon: EOS-5DMKIII is used. For Nikon: D810 is used. I was fortunate to get an early delivery of this lens after returning another newly announced 24-70 because it was simply not very sharp. Tamron has really hit this one out of the park! The G2 version is very solid and well built. It focuses quickly and quietly on my Nikon D610 and focus is pretty accurate at all focal lengths. I expected excellent sharpness but when I did a series of tripod-mounted resolution test at different apertures and focal lengths, the results were amazing. Kudos to Tamron for designing and building a winner. This will become a VERY popular lens. 100 grams more weight Very complex focus shift requires Tamron TAP in console to compensate. The new G2 lens has a nice haptic and design, i.e. all buttons are much better to grip and operate. The new focus module is now really snappy and the VR operates smoothly hard to notice even. The older version you could feel and hear the glass moving around often at VC. Bokeh is the same, sharpness is slightly better at 2,8 but gets surprisingly significantly better compared to the older version once stopped down. Just a slight stop to 3,2 improves micro contrast and border sharpness dramatically at 70mm. I am happy with it so the lens is a keeper for me. It is much more compact than the Nikon 24-70 not to argue about the price that is almost half of it.